This was Argus' first real win in Chikara, They did a story beat where Snowflake reverted back to Kevin Condron to tell Argus that he knows him and that he shouldn't hurt him. Argus hit Snowflake anyway for the win. Frightmare beat Silver Ant with a body scissors into a victory roll from an ankelock attempt by Silver in 10 min. This was really good. Ring Announcer Gavin Loudspeaker (who was back for the finale) introduced Vladimir Rabinsky, basically passing the torch to him as the new Chikara Ring Announcer going forward. This was an insanely perfect mix of high paced action and comedy. There wasn't a down beat in the whole 9 minutes. Great effort. Gavin Loudspeaker introduced Chikara's Director of Fun, Mike Quackenbush. Quack mentions the 2015 Chikara Yearbook and the lights in the arena go out. When they return up, Archibald Peck appears standing in the ring. He sees Quack and the yearbook then shoves Quack to take it. Peck reads through the yearbook and appears to find out his demise last season at the hands of Deucalion. Peck freaked out and left through the crowd yelling at people not to touch him. This was a pay off of a storyline nearly 5 years old where Peck was sent into the future and returned with the Chikara 2015 Yearbook. The crowd went crazy for this. (1) Dasher Hatfield pinned Mr Azerbaijan in about 1 minute with a small package. (3) Pinkie Sanchez pinned Hype Rockwell with a modified DDT in 22 minutes. (4) Pinkie Sanchez pinned Amasis in 23 minutes with a missile dropkick. (5) Jakob Hammermeier pinned Worker Ant in 25 minutes with a Worldstar! punch. (6) Jakob Hammermeier pinned Farmer Frog in 26 minutes after a powerbomb out of the corner thanks to a Pinkie Sanchez distraction. (7) Heidi Lovelace pinned Jakob Hammermeier in 27 minutes with a waistlock roll-up. (8) Dasher Hatfield pinned The Proletariat Boar of Moldova in 29 minutes with a Jackhammer. (9) Wani pinned Race Jaxon in 30ish minutes with a palm strike. (10) Oleg the Usurper pinned Wani in 31 minutes with Off with his head. (11) "Mr. Touchdown" Mark Angelosetti pinned Oleg the Usuper in 34 minutes after a superplex then a spear. (12) Juan Francisco de Coronado pinned Heidi Lovelace in 36 minutes after a sitout powerbomb. (13) Dasher Hatfield pinned Pinkie Sanchez after a jackhammer in 38 minutes. (14) Dasher Hatfield was counted out in 40+ minutes after being knocked off the ring apron by Angelosetti accidentally. Juan ran them into each other as the count was near 20. Angelosetti tried to go after Dasher, but was pulled back into the ring by his foot by Juan. (15) Juan Francisco de Coronado pinned Mark Angelosetti with a delayed German suplex in 41 minutes to win the Cibernetico. Another big payoff to a Chikara story here as Soldier went AWOL and then came back during the return brainwashed by the Flood. Soldier has been under the spell of the Eye of Tyr and Jakob Hammermeier's BDK since the dissolution of the Flood at the end of last season. Soldier (who is scarred, missing an antenna) ripped off one of Fire's antenna's during the match. Soldier's trance was finally broken when Jakob got into a fight with referee Derek Sabato (who used to be a BDK member) and went to hit him with his WORLDSTAR! punch, but accidentally hit Soldier. Solider saluted Fire Ant. He then saluted Silver Ant. Worker Ant came out and the crowd chanted "Please Be Friends!". They saluted each other. Worker returned Soldier's King of Trios medal the Colony won in 2011. Everyone embraced. People cried. This was a crazy moment only found in Chikara. So insanely good and special. I've never seen a crowd so happy to get a non-finish before. Crown & Court (Princess Kimber Lee (c), Jervis Cottonbelly, & Los Ice Creams (El Hijo del Ice Cream & Ice Cream, Jr.) beat The Wrecking Crew (Jaka & The Devastation Corporation (Max Smashmaster (c), Blaster McMassive, & Flex Rumblecrunch) to win the season long Challenge of the Immortals tournament in 19 minutes when Kimber Lee pinned McMassive after a powerbomb out of the corner into an Alligator Clutch. Crowd lost it when Crown & Court won it. They were, pardon the term, the Cinderella team of the tournament and really only ended up in the finals thanks to the angle with Dasher & Mr. Touchdown forcing Dasher to vacate his team's points in the tournament. Each member of Crown & Court was presented with a Golden Opportunity, which in Chikara can usually mean anything but in this case was the form of 3 Golden Point Tokens needed to challenge for any Chikara championship. Hallowicked beat Icarus and Eddie Kingston in a Triple Threat Match in 24 minutes to retain the Chikara Grand Championship for a 6th time. Wicked p Kingston after a crossed leg DDT. This was the first time a Chikara championship was defended in a 3 way and also featured all 3 Chikara Grand Champions from the company's history. Match was very good. As referees checked on Hallowicked, Princess Kimber Lee's music hit. The crowd went crazy. Golden opportunities apparently can be used at any time and cannot be lost (in Chikara, you need 3 points to challenge for titles which means 3 wins in a row without a loss outside of special competition). 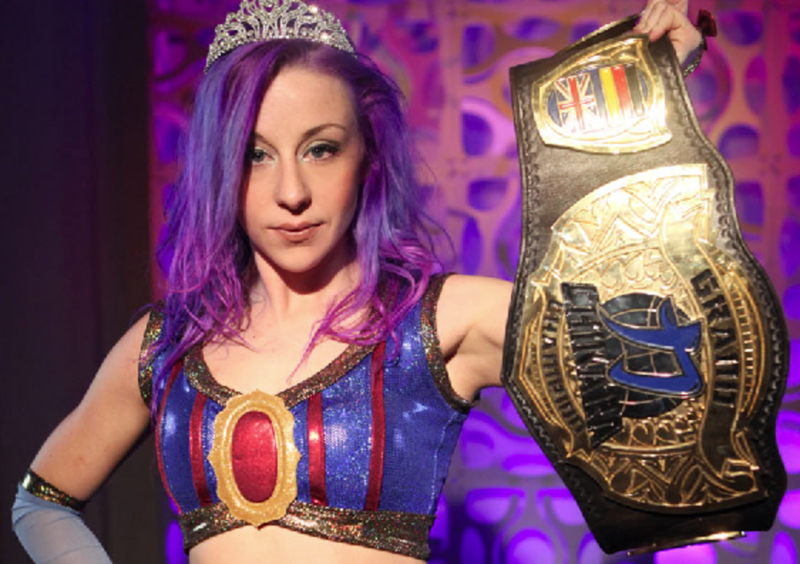 Princess Kimber Lee beat Hallowicked by submission in 5 minutes to become the 4th Chikara Grand Champion with the Chikara Special. This was a crazy moment. The crowd lost it. Chikara goes out of its way to present Kimber Lee, Heidi, and any other female that comes through the company as just wrestlers. In the year plus that Kimber Lee has been on shows, my wife and I have personally seen a huge increase in young little girls coming to the shows. They leave with smiles and the general execution of her rise has been so perfectly handled that a crowd at the old ECW arena (which tends to be the most adult crowd at Chikara shows) behaved like 5 years at the finish. As an aside, special Crown & Court shirts were made by fans (us, full disclosure) specially for the finale for support. The shirts were given to anyone who makes a $20 donation that will be given directly to Chikara & Jervis Cottonbelly's charity of choice: Philabundance. We have a few of them left in sizes M-XL and we can ship anywhere in the US for $5. So far we've raised about $500 for the charity. I'd love to get rid of the remaining shirts and get over $600.